On a hot and sticky Texas night, when the cicada chorus has died and the lights from a passing electrical storm no longer dance on my bedroom walls, Africa comes calling. It is not the first time she has visited, and likely not the last. Africa is a barefoot child, standing in the doorway of a cinderblock house, eating a red banana. She is a baby elephant following her hulking mother through the bush, flapping her ears and raising her trunk to trumpet in playful imitation. She is the whirl of color and motion at the bazaar, the pure-white crown of Kilimanjaro, the bright red shuka (robe) of the Maasai. In my mind her colors fade with time, but still they are more vivid than the rest. It's been 12 months since my family set out for Tanzania, in East Africa, on a Tauck safari. Like all good vacations, it was the kind of trip that changes how you look at the world -- and leaves you wanting more. So when school lets out this summer, we'll be winging our way east once again, this time to check out the continent's other prime safari region, in Southern Africa. Most of our days will be spent in Botswana, a peaceful and democratic country that is nearly the size of Texas, but with only 1.7 million residents. There are twice that many people within 25 miles of my home in Houston, so I'm looking forward to a lot more elbow room. In fact, Botswana's game preserves are so vast and remote that one must fly bush planes to and between them. 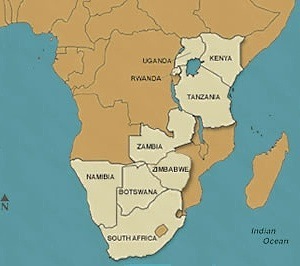 The country is land-locked, bordering South Africa, Zambia, Namibia, Angola and Zimbabwe. Tented camps will be home as we venture out to meet the Bushmen of the Kalahari and explore the Okavango Delta by dugout canoe. We'll be traveling with a company called African Travel, a sister company to Trafalgar, Insight and Uniworld that has operated on the continent for more than 30 years. African Travel utilizes the best accommodations -- tented camps, lodges and hotels -- in each destination visited. The company operates small-group safaris on scheduled departure dates and also customizes safaris for groups of as few as four people. Visit our safari site, AfricaSafari.com, for a complete list of African Travel safaris. As always, I'll report on what I find in upcoming issues of this newsletter, including a "live" report from the bush. But having been to Africa once, I should warn you in advance...I won't be able to do justice to the place.